Starting last week, Binghamton has a new, ahem, venue for preparing and serving free lunches: a dumpster. No, it’s doesn’t involve dumpster diving. Nor does it even resemble a dumpster. To be more descriptive, it’s a converted, nicely-appointed dumpster with recycled kitchen equipment. Waste Management cleaned up the bin (it was apparently sitting unused) and installed the used cooking gear. Every Friday this summer, area food recovery group CHOW will provide the food to serve free lunches, with Catholic Charities involved, too. (WF reader/commenter extraordinaire Dan Livingston is involved and quoted. “Waste Management has also provided take-out trays, so any of the leftovers, the parents were encouraged to fill a take-out tray,” said Marsha Maroney with Catholic Charities. I have to say: the choice of a dumpster is a bit puzzling. Then again, it seems somewhat appropriate–food that otherwise would be sent to a dumpster is instead prepared in one. Plus, it is pretty nice-looking (and reminds me of the shipping container bar in a Heineken ad). What do you make of this? Is it insulting to those seeking a free meal? Hip re-use of old stuff? Something in between? This entry was posted in Food Recovery, Hunger. Bookmark the permalink. Both comments and trackbacks are currently closed. I think it’s a perfect solution. The food is recycled and so is the container. Would you rather they built something new? Kinda goes against everything we are striving for to build new? 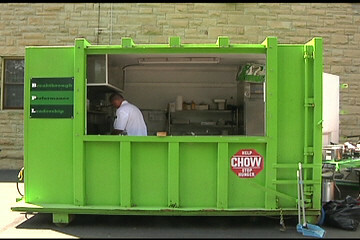 Love the dumpster kitchen, I’d take one in a heartbeat! No, I think it’s fine. It’s not a big deal–they had an extra dumpster so that’s what they used–to me. But I do think using anything other than a dumpster would have eliminated this concern. What I don’t know and the journalists covering this neglected to find out is how those receiving the food feel about the choice of venue. I’d guess they don’t care that much, but it’d be nice to hear from some of those folks. There has been some hub-bub about the dumpsterness of the Dumpster Kitchen, however I think that in light of the fact that most of the food served is recovered food, and that most of the food that CHOW distributed last year was recovered kinda puts these concerns in a sidebar; notwithstanding the fact that there has been much excited talk about the kitchen amongst those who patronized it, and that the soup kitchen cooks thing it’s quite apt and timely to boot. Additionally, the new partnership between food recovery and Waste Management has the potential to bear some delicious and recoverable fruits. The pantry coordinator at Catholic Charities has told me personally that the kids are still talking about it, and are greatly anticipating the next meal this Friday. Personally, I welcome indignant responses from the community, because it’s an opportunity to talk about a subject that’s near and dear to us all: WastedFood. It’s really kind of cute and it probably will make people think about the whole issue of wasted food. I’m coming around to the view that the “dumpsterness” of the DK is a brilliant way to gain attention to our favorite issues: hunger and food waste. Yes, bernie, I could see that. I’d call it Junk Food, though (natch). And your comment totally reminds me of the “Derelicte” fashion line in Zoolander. I’m smiling now thinking of Will Ferrel introducing his new line.